Jasper Partnership Commission Meeting lead by Mayor Bill Schmitt took place January 18 and Sister Cities of Jasper Board Meeting January 24 at the Schnitzelbank. Members of the Jasper Partnership Commission attended the Sister Cities of Indiana Annual Meeting in Indianapolis on January 18. Attending from Jasper were Raymie Eckerle, Mayor Bill Schmitt, Vic Knies, Patti Goepfrich, and Matthias Hilger. Mr. Hilger presented Patrick Madden, Executive Director of SCI, Inc. with a binder of Sister Cities of Jasper accomplishments. 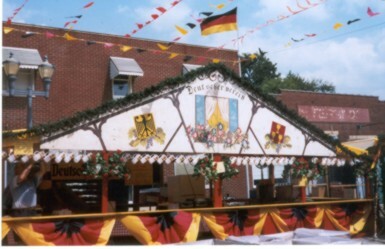 City Hall sent an official written invitation to Pfaffenweiler to join Jasper for the 30 th anniversary of the Jasper Strassenfest in August. Tom Kiefer visited Pfaffenweiler and met with relatives June 25 - July 1 on a whirlwind trip through Germany. Annika Marschall arrived from Pfaffenweiler for two semesters at Jasper High School . She arrived on July 21 st and stayed with Jim and Louise Gutgsell. She joined the JHS Marching Band and the JHS Swim team. She was originally scheduled to stay only one semester but extended her stay so that she could attend both semesters. Patricia Keller and Thomas Lehmann arrived on July 25 th to attend the Strassenfest. They stayed a week with Dave and Janet Kluemper. Sebastian Loeffler from Faust Gymnasium Staufen arrived in Jasper for two semesters at Jasper High School . He arrived on August 6 th and stayed with Rosalie Ruell. At 15 years of age, he made the JHS Varsity Soccer Team and was their top goal scorer. In September, exchange students from Staufen visited Jasper High School for three weeks before heading back to Germany via New York City - August 31 - September 19. Staufen students expressed huge interest in attending Jasper High School for one year. Four preliminary applications for the 2009-2010 schoolyear have been received.